Every birthday should be celebrated with cake. And if you’re looking for a new alternative to all the chocolate, mocha, and ube varieties available in the market, here’s the next best thing for you: Milkface Bakes’ Birthday Cake Babies. 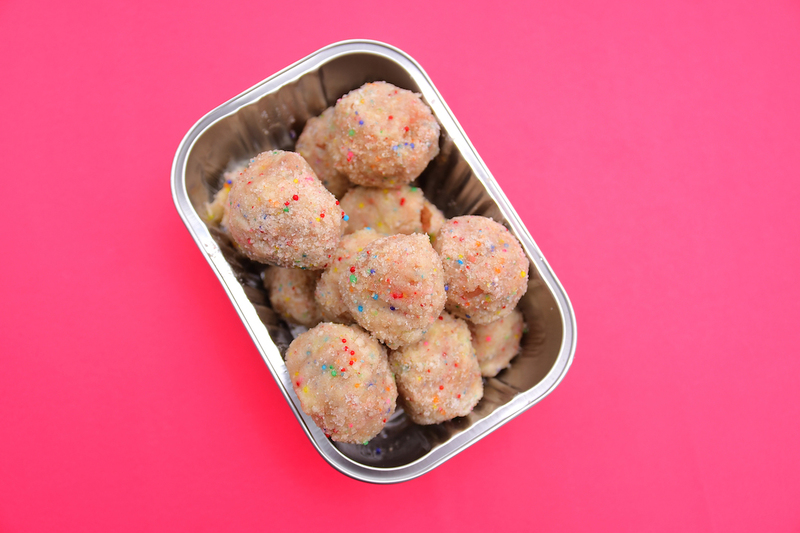 These sweet morsels are inspired by Milk Bar Bakery’s Birthday Cake Truffles. It uses birthday cake crumbs for its base, which are then flavored with vanilla milk. It’s scooped into bites, drizzled with melted white chocolate, and rolled in “Birthday Cake Sand.” The latter is the ground crunchy parts of the birthday cake. “I’d like to think of it as a rebellious cake pop,” shares Milkface Bakes owner Therese Laforteza, who adores Milk Bar Bakery owner Christina Tosi. She admits, however, that she’s never been to any of the Milk Bar stores. “But I read about Christina Tosi’s Crack Pie somewhere online when I was learning how to bake on my own, and wanted to immediately try making it.” Watching videos of the celebrated baker helped Laforteza fall in love with baking just as much. She’s adopted the same philosophy for her own products, which, aside from the cake truffles, include an assortment of soft batch cookies, cream cheese batter cookies, snowball cookies, and other specialty cakes and desserts. Laforteza started out by baking these products only for family and friends, with her husband, toddler, and a handful of friends serving as her toughest critics. “It was really self study, but the memory of seeing my mom and tita bake also helped and made me understand some terms more,” Laforteza adds. Soon, more and more clamored for Milkface Bakes products—which is, by the way, taken from the nickname to her then only baby, who was purely breastfed. And soon enough, Milkface will grow to become an established name, which will become part of every birthday celebration. To order, contact +63918-410-5222 or visit @milkfacebakes or @thebakedgood. P320 for 13 pieces; P350 for a complete kit with ribbon and birthday candle. Add extra creamy vanilla frosting on the side for P50.